During a family holiday this week, my wife suggested that other road users and pedestrians may take my erratic driving and sudden stops as incompetence behind the wheel. I suspect that this may have been a veiled insult to my driving prowess, but since she will neither drive nor navigate while abroad and stubbornly refused to help identify the many raptors soaring over Orlando, Fl., I had to do all three as we headed to Universal’s Wizarding World of Harry Potter. Having spent 3 days standing in lines waiting to get on two-minute rides, I was beginning to get tetchy. As if the parks are not busy enough already, we had chosen to visit over President’s Day weekend and were horrified to find that the Harry Potter section was full and cordoned off by 09.00. This is not good habitat for a Redgannet; I had to get out of line. Eventually Helen took pity on the other motorists, and sent me off to look at some birds while she took an afternoon by the pool with our son. 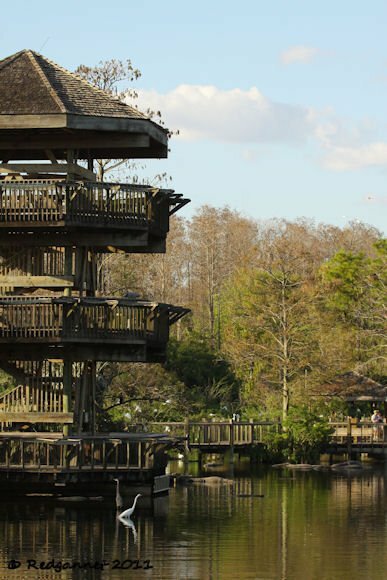 I chose to have a look at “Gatorland”, which boasts a boardwalk that runs through a swamp giving superb access to the heronries there. 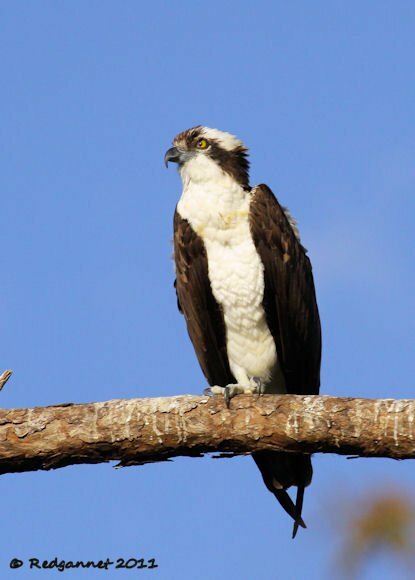 Breeding behaviour and plumage was very apparent, but John Wise, an ex-pat Brit now resident in Orlando, told me that the birds’ activities had been held up for a couple of weeks during a cold snap that saw frosts in Florida. 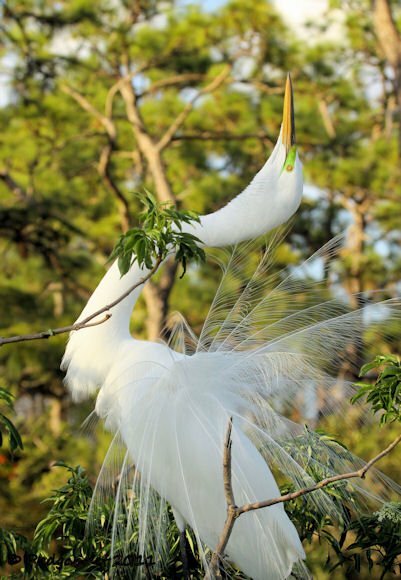 I don’t recall being so close to Great Egrets showing off their facial skin and plumes before. The feathers, so popular with milliners of the past, were being preened and displayed within an arms length of the boardwalk and it was the first time I had noticed that the filamentous plumes are erectile and can be fanned like a peacock’s tail. This individual included the neck-stretching demonstration as part of his display. I am going to stick my neck out too in making the assumption that although the sexes are identical, it is the male that chooses the stage and performs for the female. The colonies at “Gatorland” include other large wading birds too. 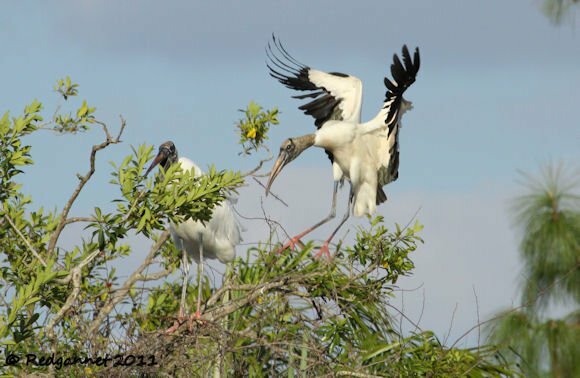 Snowy Egrets were also showing off their breeding colours and Wood Storks were carrying small branches to add to precarious platforms that will soon have to serve as nests. By building nests out over the swamp, the birds benefit from the protection offered by the alligators in deterring predators such as raccoons and snakes. Occasionally a chick will fall and be released back into the food chain by the alligators, but on the whole, the birds get a good deal providing that they build their nests beyond the jumping capability (as much as 5 feet as demonstrated in the “Jumperoo Show”) of the reptiles. 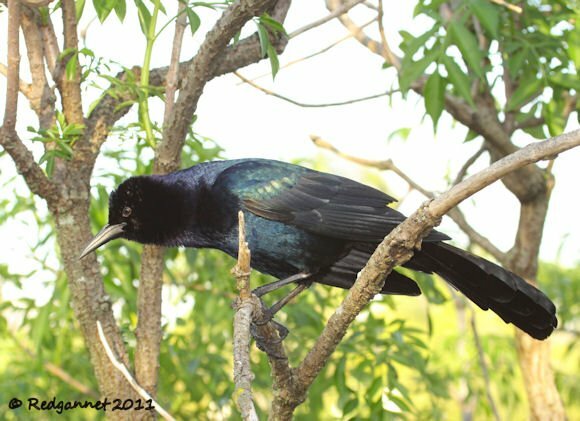 Boat-tailed Grackles count eggs and chicks as part of their diet and they were well represented here today. The grackles might well be found here anyway as they like the wet habitat in Florida, but as an extra enticement, visitors feed the alligators with hot dogs and there is always a little something left over for a cheeky omnivore. Mike’s suggestion that the “Angry Birds”might share some similarities with actual species made me think that a field guide to birds and wingéd creatures of Universal’s “Islands of Adventure” might make an interesting read. Below for example is the Hippogriff, but which ornithological influences were used to portray such a beast? There are more at the Orlando, Florida post on Redgannet. 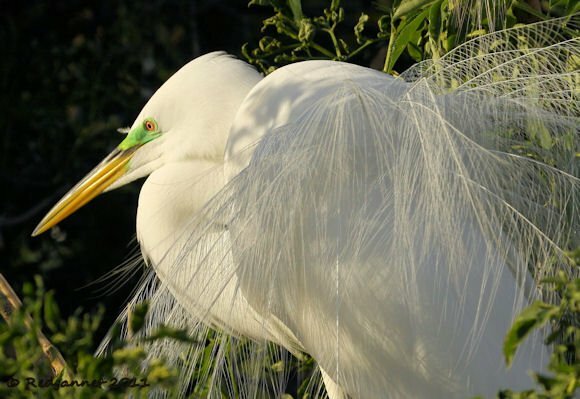 Those egrets in breeding plumage are absolutely exquisite! 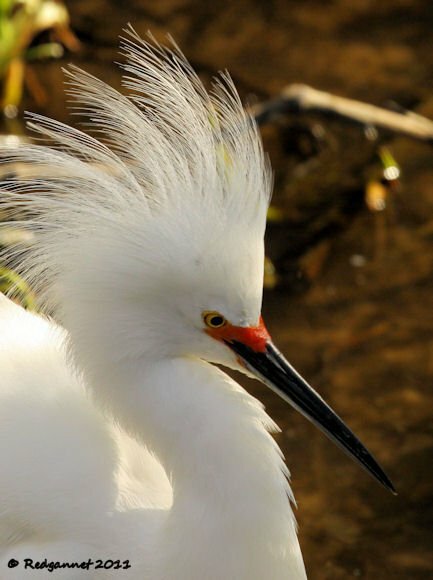 I have never been lucky enough to witness displaying egrets. What a show … er … show-off! 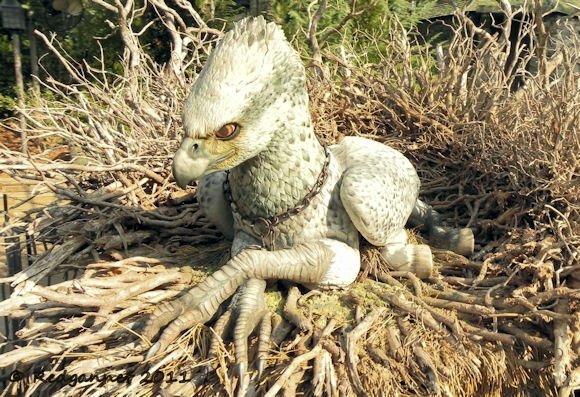 And despite the Hippogriff looking somewhat like a Harpy Eagle, I maintain Rowling was looking at a Robin while writing the Prisoner of Azkaban.